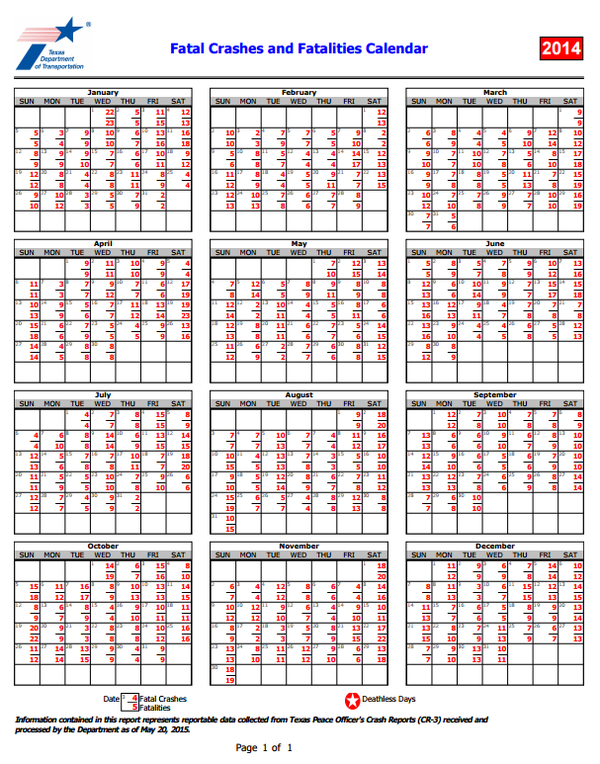 This calendar is published by the Texas Department of Transportation as part of its traffic safety efforts. It shows how many fatal collisions and traffic deaths happened every day of the year. On average, someone is killed every two and a half hours on Texas streets, and someone is injured every two minutes, according to TxDOT [PDF]. State officials in Texas attribute the problem to drunk driving and failure to use seat belts — not any shortcoming in their own work. Just one day without a traffic fatality is the agency’s depressingly unambitious goal: #EndTheStreak, they call it. TxDOT’s strategy seems to consist mainly of using Twitter and PSAs to reach drivers. What if, instead of #EndTheStreak, Texas state transportation officials got serious about ending traffic fatalities altogether? What if they launched a statewide Vision Zero campaign? A concerted effort to reduce traffic deaths would have to involve solutions much more substantial than PSAs. It would require an entire rethinking of the state’s transportation policies. A growing number of American cities are adopting Vision Zero goals and laying out plans to fix their dangerously designed streets — making more room for walking and biking while taming speeding traffic. The idea is gaining momentum in Texas cities too. TxDOT’s #EndTheStreak campaign clearly isn’t getting the job done. Statewide traffic deaths increased 3.7 percent in 2014 compared to the year before [PDF]. Without a fundamental paradigm shift, there’s no reason to expect this year’s calendar will be any different. LOS ANGELES — Cities belonging to the 710 Coalition have come out in support of the draft 2016 regional transportation plan by the Southern California Association of Governments. The draft calls for connecting the Long Beach (710) Freeway to the Foothill (210) Freeway in Pasadena via a tunnel. Coalition member cities are Alhambra, Monterey Park, Rosemead, San Gabriel and San Marino. They say not closing the gap between the two freeways will result in more surface traffic on their streets. The draft transportation plan continues to include the freeway extension as part of the state highway system. In addition, the draft plan accelerates the project completion date five years from 2030 to 2025. Caltrans reports that three of the top 10 most severe afternoon traffic bottlenecks in Los Angeles and Ventura counties are near where the 710 currently ends at Valley Boulevard on the border of Alhambra and the Los Angeles community of El Sereno. But an opposing coalition, Beyond the 710, says the tunnel project is too expensive and would devastate communities in its path. Members of the Beyond the 710 Coalition include the cities of Pasadena, South Pasadena, La Canada-Flintridge, Sierra Madre and Glendale. The final environmental impact report for the 710 North tunnel is being competed and should be released early this year.